The National Basketball Association All-Star Weekend is a weekend festival held every February during the middle of the NBA regular season that consists of a variety of basketball events, exhibitions, and performances culminating in the NBA All-Star Game held on Sunday night. No regular season games are held during this period, which is also known as the All-Star break. It is right after the trade deadline. The 2017 game was held at Smoothie King Center in New Orleans, home of the New Orleans Pelicans. The 2018 NBA All-Star Game was held at Staples Center in Los Angeles, California, home of the Los Angeles Lakers and Los Angeles Clippers. The 2019 NBA All-Star Game will be held at Spectrum Center in Charlotte, North Carolina, home of the Charlotte Hornets. The NBA Jam Session, a "theme park of basketball", has been a part of the All-Star festivities since 1992, with fans able to take part in numerous interactive basketball related activities from Thursday through Monday. The NBA Jam Session is usually targeted to young fans. NBA All-Star Celebrity Game: First held in 2003, the game features retired NBA players, WNBA players, actors, musicians, and athletes from sports other than basketball. Rising Stars Challenge: From 1994 until 1999, the event was called the "Rookie Game," and composed entirely of first-year players. From 2000 through 2011, the game, renamed the "Rookie Challenge", featured a team of first-year players ('Rookies') against a team of second-year players ('Sophomores'). The 2012 game debuted a new name, the "Rising Stars Challenge", and a new format. While the game continued to feature first- and second-year players, the participants were assigned to teams in a "fantasy draft" by two honorary captains (Charles Barkley and Shaquille O'Neal in 2012 and 2013, Grant Hill and Chris Webber in 2014). In 2015, the Rising Stars Challenge format was switched again to a USA vs the World format, which is the current format in use. G League Dream Factory Friday Night: First held in 2008, the events includes a slam dunk contest and a three-point shootout. These events were modeled after the NBA All-Star Saturday Night events. G League All-Star Game: First held in 2007, this game features the best players from the NBA G League. The first winner was the East by a score of 114–100. The G League All-Star game was not held in the same arena as all the other All-Star Saturday activities. Instead, it was held on NBA Jam Session's practice court. Slam Dunk Contest: This competition showcases the creativity and athletic ability of some of the league's best and youngest dunkers. The specific rules of the contest are decided each year, but the competition is always judged subjectively. After each dunk, or attempted dunk, competitors are awarded a mark out of 10 from five judges, giving a possible high score of 50. The usual rules of 'traveling' and double dribbling do not apply. The most recent winner is Hamidou Diallo of the Oklahoma City Thunder. Three-Point Contest: The league's best three point shooters shoot five basketballs from five different spots around the three-point line. Each shot is worth one point except the last ball of each rack (informally called 'money balls'), which is worth two points. The highest score available in one round has been 34 points since 2014, when the format changed so that in addition to the last ball of every rack, one of the five racks would contain entirely money balls. The shooters have one minute to shoot the basketballs. The most recent winner is Joe Harris of the Brooklyn Nets. 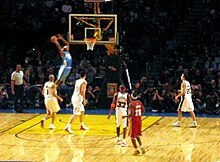 Skills Challenge: Making its debut in 2003, the Skills Challenge pits selected players in a timed obstacle course of dribbling, shooting and passing. Agility, quickness and accuracy all come into play. The most recent winner is Jayson Tatum of the Boston Celtics. Legends Classic: Held from 1984 to 1993, the Classic was a game featuring retired NBA players. As in the All-Star Game, the teams were designated East and West. The Legends game opened the Saturday program. The NBA canceled the Legends Classic after 1994 due to the players' frequent injuries from the game, perhaps due to the large range in fitness levels among younger and older alumni. The Rising Stars Challenge is its replacement. ^ DuPree, David (February 12, 2002). "NBA's brightest stars set to collide". USA Today. Archived from the original on February 22, 2013. ^ "How NBA's new voting format determined All-Star starters, snubs". ESPN.com. 2017-01-20. Retrieved 2019-01-04. ^ "NBA All-Star Game draft results: LeBron James, Stephen Curry select their teams". CBSSports.com. Retrieved 2019-01-04. ^ "TNT to air H-O-R-S-E game featuring NBA players" (Press release). NBA. February 5, 2009. Retrieved June 21, 2009.